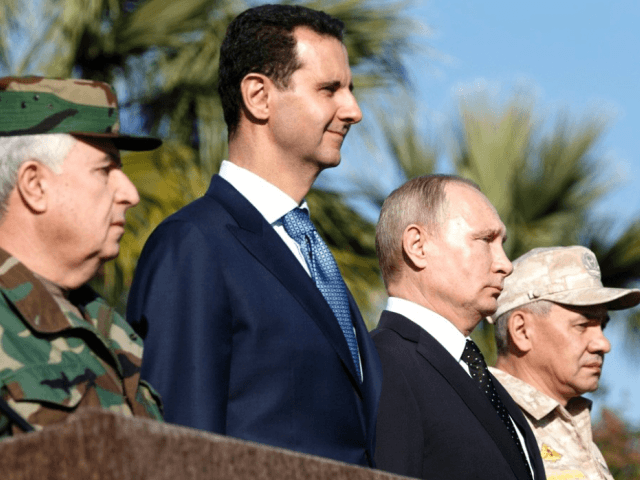 Russia is reportedly trying to ensure its military gains in Syria on behalf of Iranian-backed dictator Bashar al-Assad evolves into a political solution that secures its interests in the Middle East. Currently, Assad controls the largest portion of Syria, courtesy of support from Russian and Iran, followed by U.S.-allied Kurdish militias who command much of the northern part of the country and are not too concerned with fighting the Syrian troops, reports Reuters. Meanwhile, opposition rebels reportedly control patches of land. Under Assad, Syria is expected to allow Russia to establish a permanent presence in the Middle East, rivaling U.S. influence in the region. Support from Russian and Iran allowed the struggling Assad forces to turn the tide of the Syrian war in their favor. As U.N.-backed talks in Geneva fail to make any progress, Russia is preparing to launch its own political process in 2018. President Vladimir Putin declared mission accomplished for the military on a visit to Russia’s Syrian air base this week, and said conditions were ripe for a political solution. Reuters learned from an unnamed senior Syrian opposition official that the United States finally “surrendered to the Russian vision” on ending the war, despite Washington’s insistence that Assad is removed from power. The view in Syria is that Russia will ensure Assad remains in power. “It is clear a track is underway, and the Russians are overseeing it,” an unnamed Syrian official told Reuters, referring to the future of the country. “There is a shift in the path of the crisis in Syria, a shift for the better,” added the official. Citing analysts, Reuters acknowledges that it is difficult to foresee Russian diplomacy bringing about lasting peace in Syria, urging the millions of refugee to return home, and ensuring Western reconstruction aid. However, Assad does not appear willing to compromise with his opponents, which include the United States. Assad has allowed U.S.-designated state-sponsor of terrorism Iran to expand its presence and influence in the region. “At the same time, the dictatorships of the Democratic People’s Republic of Korea and the Islamic Republic of Iran are determined to destabilize regions, threaten Americans and our allies, and brutalize their own people,” it adds.